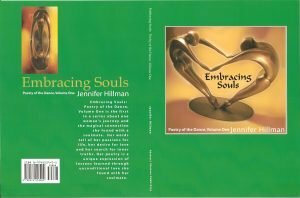 “Embracing Souls: Poetry of the Dance, Volume One” is the first in series about one woman’s journey and the magical connection she found with a soul mate. This connection opens her heart to a new world of possibilities. Awaken through continuing conversation in lucid dreams, she learns more about herself, her true dreams and begins her adventures as she finds her dream guy is real. Her words tell of her passions for life; her wish for love and her search for inner truths. Her feelings expressed of this confusing form of love with all the ups and downs of unrequited love except in spiritual realm. Her poetry is a unique expression of lessons learned through unconditional love she found with her soul mate.